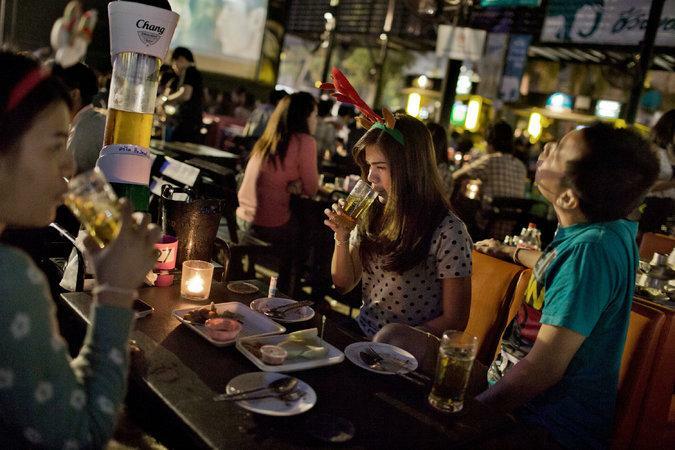 People drank Chang beer at a bar in Udon Thani, Thailand, in January. UDON THANI, Thailand — It was probably inevitable in a country so obsessed with food and drink that Thailand’s political turmoil would spill over into beer. Singha beer, made by the oldest brewery in Thailand, is a national icon and a staple of Thai restaurants around the world. But in recent weeks it has also become a target of an informal boycott by Thais who are angry that a member of the wealthy family behind the beer company is one of the leaders of antigovernment demonstrators who are trying to scuttle elections planned for next month. Thailand’s political turmoil defies concise explanation, but the beer boycott is emblematic of one striking division in Thailand today: the chasm between middle- and upper-class protesters in Bangkok, and the millions of voters in the provinces who are bewildered and angered at the protesters’ attempts to oust the government and to stop the elections that seem almost sure to return the government to power. Chitpas Bhirombhakdi, whose family owns the Boon Rawd Brewery, said rural areas did not understand democracy. The remarks incited palpable anger here in northeastern Thailand, a vast and formerly impoverished rice-growing region that has seen sharp improvements in living conditions and education in recent decades, partly because of the policies of Thaksin Shinawatra, the billionaire tycoon and former prime minister who is the focus of the protests. For decades, northeastern Thailand was the region that supplied the country with domestic servants, construction workers, taxi drivers. Now, with a third of Thailand’s population, it also delivers the votes that have been instrumental in electing the governing party — which includes Mr. Thaksin’s sister, Prime Minister Yingluck Shinawatra — that the protesters are so determined to oust from power. To detractors in the northeast, Ms. Chitpas, an aspiring politician who is a direct descendant of a 19th-century Thai king, is a symbol of a Bangkok upper class holding onto vestiges of feudal power and not trusting rural voters to make the right choice at the ballot box. She did not respond to a request for further clarification. Kwanchai Praipana, the head in the northeast of a group of so-called red shirts that supports the government, says the point of the beer boycott is to send a message to companies with links to the protesters: rural people vote in elections — and with their wallets. Boon Rawd Brewery, the company that makes Singha and Leo, a cheaper beer that is popular in the northeast, declined to reveal the extent of the damage caused by the boycott. But some shopkeepers say sales of Singha and Leo around New Year’s, traditionally a time of heavy drinking, were down sharply. Kwanchai Praipana, rear left, the head of a group in the northeast called red shirts that supports the government, says the point of the beer boycott is to send a message to companies with links to the protesters that rural people vote in elections — and with their wallets. Facebook pages have been filled with images of just that: bottles of Singha and Leo being poured onto feet — a disparaging gesture in Thailand. 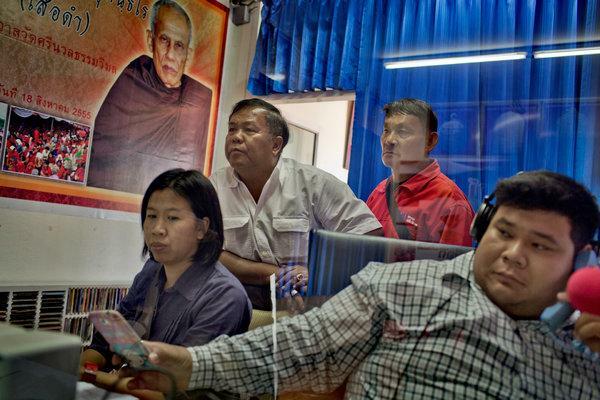 Ms. Chitpas — who ran unsuccessfully for Parliament in 2011 — and other protest leaders argue that Thailand’s democracy has been subverted by the governing party, especially the powerful Shinawatra family that has dominated Thai politics for the last decade. They remain unsatisfied by Ms. Yingluck’s decision to call new elections after the protests began — elections analysts say the governing party is almost sure to win. Instead, the demonstrators want a hiatus from democracy, replacing it with rule by a “people’s council” selected from various professions in the country. Many say they yearn for a return to the absolute monarchy because Thailand is not ready for democracy. In recent weeks the protesters have become more aggressive, trying to sabotage the election registration process. Starting on Monday they plan to “shut down” Bangkok by blocking major intersections, prompting the United States Embassy to advise American citizens to have plenty of cash and a two weeks’ supply of food and water on hand. There are persistent rumors of an impending military coup. Ms. Chitpas’s political activity appears to have caused considerable anxiety within her family’s company. A memo by Santi Bhirombhakdi, the brewery’s chief executive and the family patriarch, leaked to the Thai news media last month expressed disappointment about Ms. Chitpas’s role in the protests. In it, he said he had discussed her political career “many times” within the family and warned of consequences for the company. A few days after the memo leaked, Ms. Chitpas’s father, Chutinant Bhirombhakdi, announced that he, his wife and Ms. Chitpas would change their surname in an apparent attempt to create some distance between political activities and the family business. He did not specify the new name, but Ms. Chitpas now appears to use her mother’s maiden name, Kridakorn. For Charuwan Thanom, 53, a shop owner in northeastern Thailand, the change of surname did little to temper her anger. “There’s nothing she can do to restore her image now,” said Ms. Charuwan, who made sure that there was no Leo beer at her extended family’s New Year’s celebrations. But Mr. Kittisak, the restaurant owner, is betting that the boycott will fade away and he will soon drag the cases of Singha beer out of the storeroom. “Thais have short memories,” he said. Nearby, two customers enjoyed a meal of northeastern specialties, washed down with bottles of Heineken.